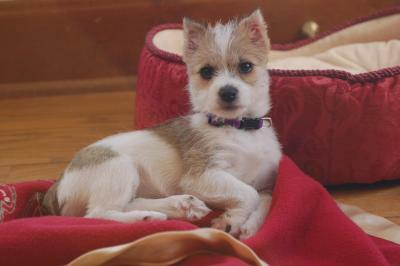 I have a Jack Russell/Miniature Schnauzer mix puppy named Maggie who is now 13 weeks old. She has done very well with housebreaking; however, whenever one of us come home, she dribbles...even if she has just went outside and urinated. Is this typical of JRTs or is this just a puppy issue? I had a JRT Sch mix for 14 years and my dog passed way recently. I'm trying to locate another because there great companions. Can someone please tell me I could locat one? Our Jack Russel did that a lot when she was a puppy by she is now 9 months and slowing growing out of it. PS She is pregnant, and my Mini Schnauzer is the father, can't wait to see what they look like. Home their as cute as yours! more a personality thing I think, just like a person who wrings their hands unconsciously while in the company of others because they are excited and nervous about socializing. She may grow out of it and it will be merely a puppy stage. She is one of the most unusual dogs I've ever seen. Just adorable! Good luck with her little accidents and thanks for sharing Maggie with us.